A glorious display of fresh blooms perfect for your friend or loved one's April birthday. The birthstone for this month is the diamond. A symbol of beauty and strength, we have added this extra special touch in the form of sparkling diamantes in the avalanche roses. 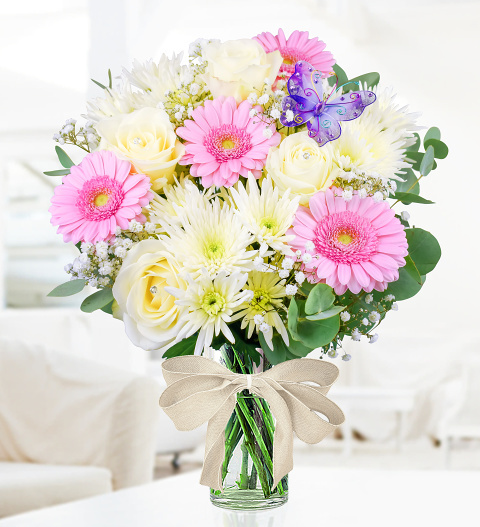 Also included within this gorgeous arrangement are dellianne chrysanthemums, gypsohphila and fragrant eucalyptus. Topped with a fabulous flower pick decorated with gems and wrapped in a white ribbon, this bouquet arrives ready to impress! Spoil somebody special on their birthday this April with a meaningful and elegant fresh flower delivery. Chocolates may contain nuts.